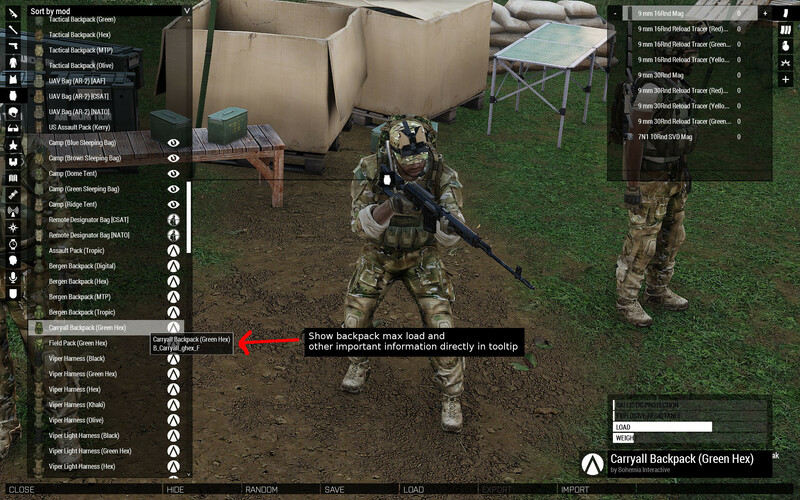 I have been playing Arma 3 for a year now and have a few suggestions to improve the usability of the virtual arsenal. The first thing is to add a quick search to the left panel. When using any weapon mods the list quickly becomes large and allowing me to search for the weapon i want would help a lot. 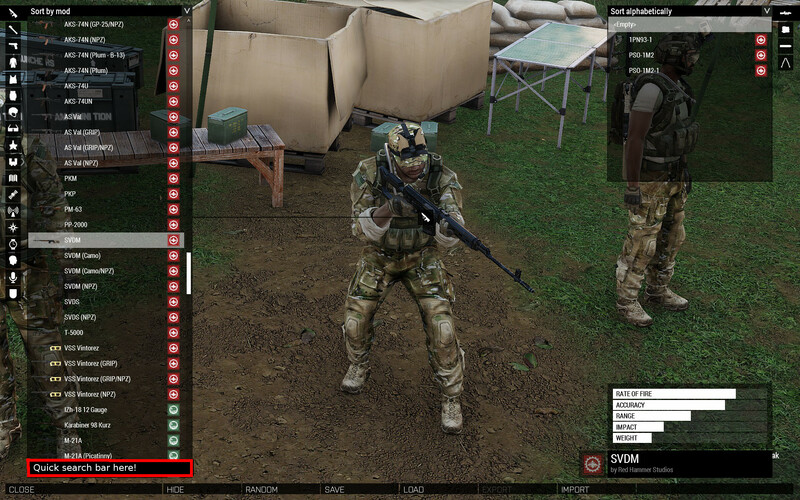 To further improve the above mentioned search bar is to add text tags to weapons. Examples sniper, smg, anti-air, anti-tank, 5.56, 7.62, ww2, modern, etc. This would help a lot for someone like me who does not know the name of every weapon ever produced or what they are good for. If i want to look at the snipers available to me for example i could quickly search for "sniper". The next thing is to improve the tooltips with actual information. 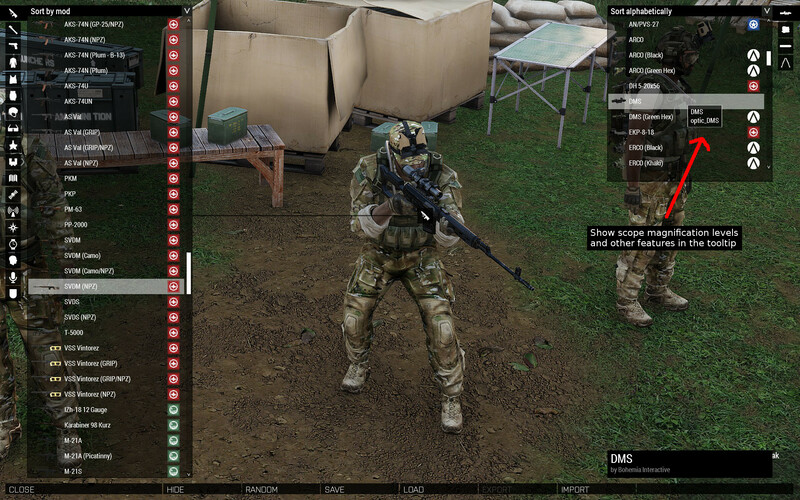 As an example when i am looking at which scope to use it would be good to actually include the magnification levels and what additional features the scope has, thermal vision, adjustable magnification, dual sights etc. As it is right now i have to either try everyone or look on the web for someone else who has already done so and been nice enough to write about it. Another place in need of improved tooltips is the weapon/equipment list. Currently i need to select every backpack to find what capacity it has. Adding that information to the tooltip would quicken the search. Showing the load capacity and weight (in numbers so that i can actually use them) would be good. And lastly the most important improvement. Show numbers at the right side of the white comparison bars located at the bottom right. It is nearly useless right now. I have no idea what a full white bar of rate of fire means. Is it linear or logarithmic? Simply show me the numbers, most players are really into weapon statistics anyway and would not be scared away. This would allow me to actually compare weapons and equipment. What? This has nothing to do with Zeus mode.